We had a fantastic Easter weekend away. Caves, trains, alpacas, chickens and lots of chocolate. The kids were in heaven and the adults had lots of laughs and red wine. I knew we were going to have a lot of car time ahead of us, so I took along this tea towel to work on. 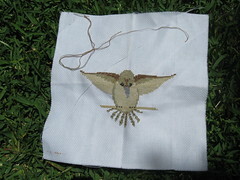 I need to finish the binding on it, but I was happy to at least finish the embroidery. The design is thanks to Posie Gets Cozy. How gorgeous are these designs and how generous to share with the community? Mired in laundry and unpacking post holiday, but hoping to hit the machine tonight to work on the baby quilt. Two of my favorite embroidered Christmas ornaments. The patterns comes from the most gorgeous shop in Burlingame, California near my brother’s house called the Status Thimble. 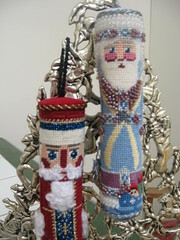 You embroider / embellish them and the shop will finish them into these gorgeous Nutcrackers. They have classes throughout the year on how to make them up with lots of different sample stitches. They have so many designs it is hard to chose. I bought another one last trip and my goal is to have one for each family member one day. That might take a few years…… a lot of years in fact. House is going from bad to worse with the painter here on top of it all. Paint, people, boxes and crazy all around. Have a great weekend! Wiggles here we come! Are any of you a fan of Turkey Feathers? I love that website and it was one of the first craft blogs I followed. Turkey Feathers is a big advocate for finishing projects you have. I guess I am not the only craft freak out there that has a few half finished projects started. This is a cross stitch my Mum bought in Sydney two years ago. She completed half of it, but found it a bit hard on her eyes. 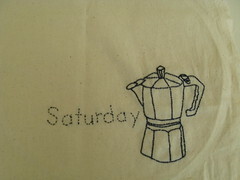 I finished it for her last weekend and ordered some lovely fabric from SupperBuzzy to sew it in a patchwork pillow. Hopefully by Christmas or is that crazy fantasy talk? This morning Sloan and I sorted through some projects and my fabric piles. Sloan was throwing fabric left right and center. Yikes…..I thought I was making progress, but I have a lot of started projects that I need to finish! 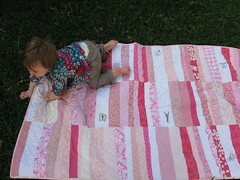 There is this beautiful quilt I want to start next year, but have promised myself that I am not allowed to start it until I finish some of smaller projects I have. I have also started a few charity sewing projects, so hopefully will get those done too and some photos to share. Have a wonderful weekend and finish what you have! Singing the “Dora” closing song, “We did it, we did it, we did it yeah!”. Sloan’s quilt is done and delivered just a few weeks after her birthday. She loves it…..I think. Here is an action shot of her crawling on it. 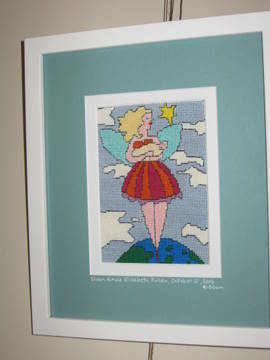 It is a Denyse Schmidt design and was inspired by the original version as seen on Pink Chalk Studio. I am working on a lot of small projects and hoping to do one bigger one before the holidays. Can you believe Xmas is coming so fast? Scary. Hopefully I might have some more photos to post with some progress. Rash is complelely gone thank goodness. It literally disappeared overnight. That was one horrible week last week with sick, cranky daughter and Mommy. Onward and upward this week! Still watching the rash. I think we are in the clear it isn’t the chicken pox thank goodness. We are still in self imposed quarantine which is getting old very fast. Here are the photos of the completed stocking. I am so excited it is done! I took a full shot with my beloved cat to try and show the scale of the monster truck Christmas Stocking. Most of my friends out there who know me would claim I am just shamelessly using this as a reason to feature my favorite Siamese model. I think I have been very restrained it has taken me this long to show him off. Rhys is lobbying heavily to have Santa fill the monster stocking for him alone. Might have to talk to him about the spirit of sharing and Christmas. I bought the pattern two years ago at the Sydney Quilt show in Darling Harbour. 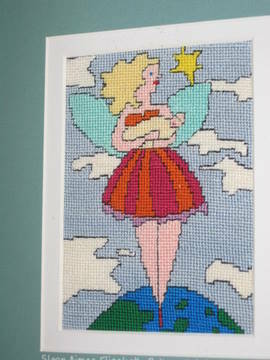 The pattern is by Christine Book and I did a Google search and it is for sale out there if any of you are interested. We had a big weekend celebrating one year with Sloan. We had some friends over and ate way too much and I drank way too much pink champagne in her honor. One year is a big moment for all of us. How blessed have we been to have her join our family? It is like she has always been here and part of us. It is hard to write just how lucky I feel to have her in our lives and how much she completes our family. I made this Jennifer Pudney embroidery piece when I was expecting Rhys. When he showed up it just felt too feminine for his room. I kept it aside just in case the stork brought a little girl in the future and here it is framed and finally hung in her room. We finally got our gear together and hung all the pictures and dolls in her room to make it look like her space. 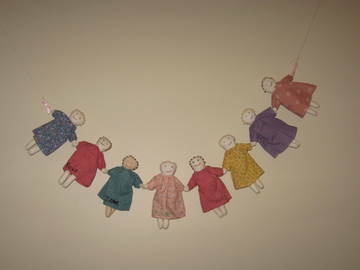 Here is a photo of the doll garland hung on her wall. I think it looks so sweet and perfect for our lady. Her room is dark, so this is as bright as I could get the photo. We are going to start some Halloween and birthday crafts this afternoon. Watch out! The brioche was delicious, even though I over caramelized it. That is my euphenism for admitting I baked it too long. I am not into sickly sweet things and this bread was light and airy with a touch of lemon and just the right sweetness. The weekend flew by with three birthday parties in two days. Can you say way too much sugar for all? And on that topic, who invented lolly bags? Christmas stocking update is enclosed. I am slowly chipping away at it and think I can finish it by Christmas so long as I don’t go overboard on Halloween, which is really hard for me to hold back. I even had a nightmare last night that I was the only one on the street not to decorate for Halloween. I definitely have issues.